If you are a jeweller or artist, CLAW Creative has a space for you. Our Fitzroy workshop provides coworking and creative spaces for all sizes and needs. So come and join with our creative minds and be inspired, share, collaborate and stretch your creative wings. Don’t yet have all your own tools? CLAW features a fully appointed shared jewellers workshop with everything you could need. Casual or permanent access plans available - book a tour today! 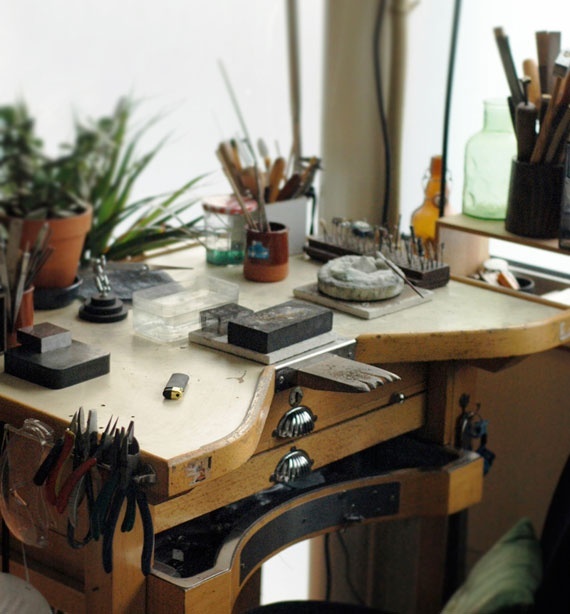 For a more permanent space for your creative endeavours you can take up a desk in our shared workshop. Each desk comes with task lighting, a secure storage locker and 24/7 access to the workshop. Need a space all to yourself? CLAW has 9 lock-up studios of different sizes depending on your needs. Flexible plans are available with or without workshop access. Contact us to learn more. CLAW Creative Gallery is a perfect space for an art gallery, photography studio or pop-up store. The wide-fronted, 35sqm space has unparalleled exposure to one of Melbourne’s busiest corridors - please contact us for further details. A open intimate space, CLAW Space is well suited for hosting informal meetings or training sessions. With painted floors and a lounge setting (seating up to 6 in total), as well as a dining table (seating 6-8), it is a welcoming and relaxed area. Additional chairs can also be arranged upon request. Accessible from the side entrance at Young St.
-For event hire enquiries please contact us.